As He released His spirit, He was taken up into the arms of the heavenly host who quickly gathered around Him and held Him with great love, comforting Him. – Yet, we know He did not ascend to the Father as yet, because after His resurrection, He told the disciples not to touch Him because He had not yet ascended to the Father. Remember what Jesus said- the only sign given to them would be the sign of Jonah, just as he was in the belly of the whale for 3 days and 3 nights so the Son of Man will be 3 days and 3 nights in the heart of the earth. Moses and Elijah were there to witness, they had met Jesus before hand at the Mount of transfiguration to discuss what was to come. Jesus had a mission…. At His death, He disarmed the powers and authorities, he made a public spectacle of our enemies in high places! 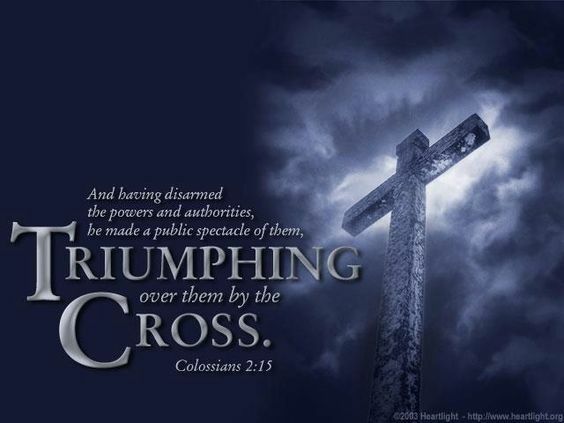 For He, our redeemer, triumphed over them by the cross. Jesus Christ, Savior of the World, was given ALL AUTHORITY in Heaven and Earth from God the Father. He has the keys to Hades. While in the heart of the earth, He went into the dark abyss with a mighty angelic force behind Him. Entering into the gates of Hell Proclaiming freedom every captive “ You have been set free! I have come to save You! Your Father in Heaven has sent for you!” His voice like thunder echoing throughout for every man and woman to hear. Teaching and preaching to them the Good News. He walked through the gates of Hell and throughout the pit of Hell, making sure He spoke to everyone who had ever been created, gathering as many as He could. Demons surrounding Him silenced in His Power unable to speak and filled with weakness, trembling in His presence. The Savior, full of power and authority continued showing the captives His hands and feet, showing everyone what our Savior had done so they could be set free. Many called out to Him, grabbing on to Him, following and believing, but yet others – in anger like the Pharisees, mocked Him and treated Him as the people of the world treated Him. Just as the Pharisees knew He was God and choose to reject Him for their own pride, status and evil hearts, so some of the people in Hell also treated Him. In the Greek tradition, we crack eggs each Easter. One person says “Christ is Risen” and the other says “Indeed He has” and we smash eggs. (Its a fun time for the family and each year there is a winner)Legend has it that eggs were brought to the tomb by Mary that special morning.The eggs are dyed red in remembrance of the blood of Jesus, the shell represents the tomb that couldn’t hold Him, the smash of the egg is in remembrance of what Jesus did to the power of the grave by disarming the powers and authorities, making a public spectacle of our enemies. Amen! What a great post! Thank you. Many Blessings on this special day. He is Alive! I have probably mentioned that I am not an evangelist, but if my writing serves that purpose then I am. I worked up the nerve to invite a guy I work with to the Easter service with my church. He told me he had promised his mom he would go with her so I asked him where. To my churches services. Cool. I prayed for God to really affect his life and not let him out there without changing him. (To be honest, I have judged this man because of his tatoos and conversation.) God just keeps drawing him closer to me. Funny thing is, when he worked he before he would not speak to me. I really like him. I am desperate for God to make some changes in me. Have to lose this fear. Oh, BTW, He is risen, this I know without a doubt. Amen Oz, I hope you had a blessed easter – and inviting others in.